Schwartzy and Waxy, so happy together! Waxman popped up his famed New York City restaurant, Barbuto, at Harry’s Pizzeria in Miami last year. 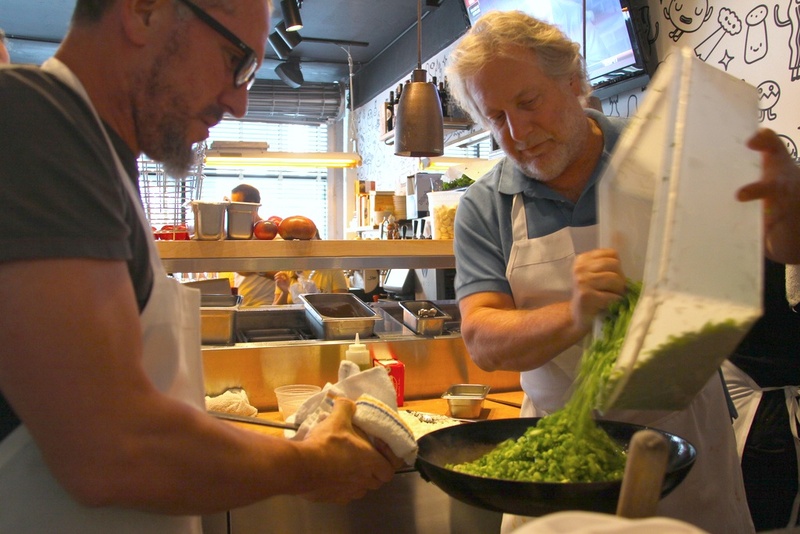 “Schwartz, you can stage at Barbuto anytime!” Jonathan Waxman emailed yesterday in response to our request for the legendary chef to host a stagiaire from the MGFD kitchen in Miami at Barbuto, his iconic West Village temple to authentic Italian cuisine. But to Michael’s dismay, he won’t be the one getting the experience of a lifetime working alongside Jdubs and his team as crisp and juicy Bell & Evans birds fly in and out of the restaurant’s magnificent wood-burning oven, seasonal veggies and housemade gnocchi get all family-style friendly, and spontaneous dance parties erupt on tables in the dining room courtesy of manager of many hats and #Ateam leader to the north, Jennifer Davidson. No, Schwartzy, sadly it’s not your lucky day, but rather Ray Melendi’s, an intern we will miss dearly as he relocates to the Big Apple after his stage to attend culinary school. Now that’s a send-off, if I’ve ever seen one! It’ll be hard work, but someone’s gotta do it. Represent us well, Ray! Grilled whole snappers from Milton Vega, stage number two. Line cook Tony pitches in to serve a table. Bourbon tiramisu? Expect the unexpected at Stagiaire Supper! Michael’s Genuine Food & Drink chef de cuisine Bradley Herron cordially invites you to participate in his third family-style meal with a purpose. Inspired by Marcus Samuelsson’s memoir, Yes: Chef, Bradley cooked up a dinner series to raise money to send one of his line cooks away to stage for a few days with a great chef. The idea is simple. Get 30 people to each spend $50 on a family style dinner in his own home, cooked by a stage hopeful with lots of help and donations from The Genuine Hospitality Group family to put it on. After two successful dinners, and stages in Jonathon Sawyer’s and soon to be Kevin Sbraga’s kitchens, the third dinner is in motion! Help us make it possible. Please say yes to Bradley with cash if you see him at MGFD or purchase your ticket through Brown Paper Tickets with credit card. Your contribution will go to send Ray Melendi to New York City to stage with legendary chef Jonathan Waxman at Barbuto. Holy shnikes! When: Sunday, January 27, 5-8:00 p.m.
Update: Photos from the amazing first dinner are here! Yum yum. Great job Steve! When: Sunday, November 4, 5-7:30 p.m.
RSVP: Please say yes to Bradley with cash or Brown Paper Tickets with credit card. Your contribution will go to send Steve Martin to Cleveland for a stage with chef Jonathon Sawyer of The Greenhouse Tavern. 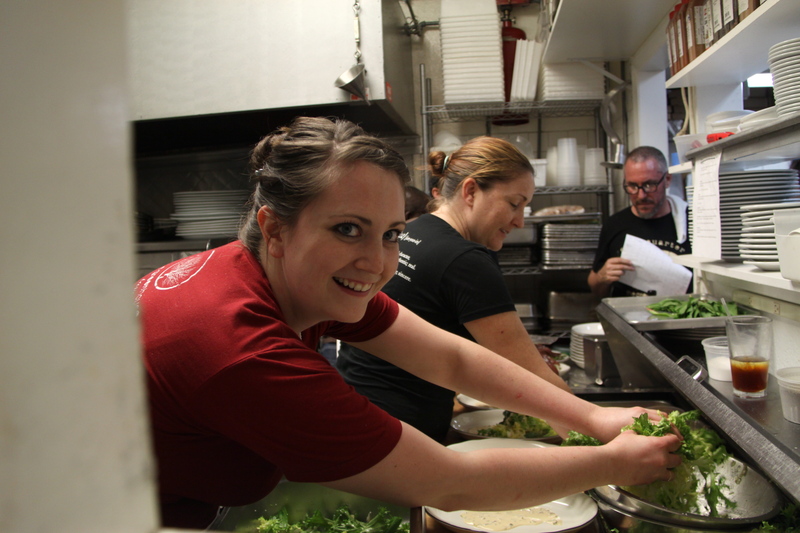 Sawyer's Noodle Cat chef de cuisine Jen Plank, seen here working last night's Greenhouse Pizzeria at Harry's, will spend a week staging at Michael's Genuine. No wonder she's so happy! One of the most important reasons we do a chef pop-up series at Harry’s isn’t even guest-related. The thinking is, break the normal routine of service for staff so that they can work closely with super talented, fun chefs they would not otherwise have the opportunity to collaborate with. The hope is that it is not only informative, but inspirational. Last night’s Greenhouse Pizzeria with chef Jonathon Sawyer at Harry’s Pizzeria was a prime example of the best case scenario. Particularly profound is his passion for history and the layers of context built into each dish on his menus. You can point out any element of any course last night, from the 170 day-aged khlii or beef fat used to cook to the “Turnips Apicius” to MSG that made the Soviet Dressing pop in the Insalata Bresaola… It all has a story and some greater meaning, that when unearthed makes everything taste that much better. Bradley flashing his pan at Harry's. And the learning continues… Since chef de cuisine Jen Plank didn’t work hard or long enough flying in two days early from Noodle Cat in Cleveland to prepare among other triumphs, the evening’s whole, boned-out Trojan Pig stuffed with sausage made from its own meat, she’s sticking around to work in the Michael’s Genuine kitchen for the week. Don’t you just love her for that? She’ll learn our ropes and even accompany forager Christopher Padin tomorrow on his Homestead farm run. I’m excited to see how she, in turn, influences MGFD chef de cuisine Bradley Herron’s work. From reading the Noodle Cat menu, it looks like they have a lot of mutual interests when it comes to flavors and ingredients. Find the photos from Greenhouse Pizzeria, slowly but surely uploading (out of order, argh!) to our Flickr set here. 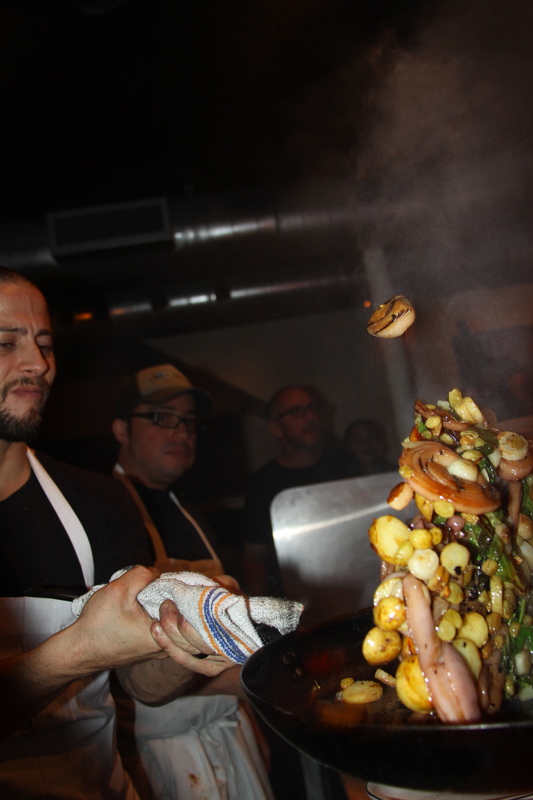 Stay tuned for the announcement of ticket sales for our next pop-up with Top Chef Kevin Sbraga here. It’s going to be a rowdy one!